The Honeywell R7140G, L, M Burner Control Modules are microprocessor-based integrated burner control for automatically fired gas, oil or combination fuel single burner applications. 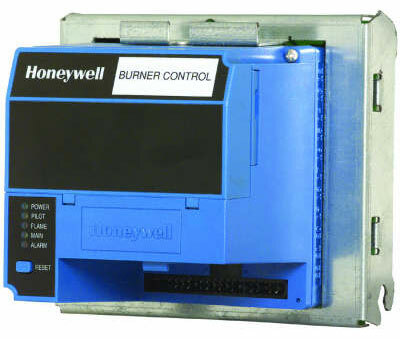 The burner control module system consists of a Relay Module, Q520A Subbase, Amplifier and Purge Card. Options include Keyboard Display Modules (KDM). The R7140 Burner Control Modules directly replace BC7000/PM720G, L, M or R4140G, L, M units using the existing Q520A Wiring Subbase. Intermittent Ignition: Is an ignition source (pilot or spark) for the main burner that was energized prior to the main fuel valve opening and remained energized during the entire time the main burner is being fired. Interrupted Ignition: is an ignition source that proves pilot flame and is stopped some specific time after the main burner fuel valve is opened.